Custom Logo Guitar: Business Promotional Items or Promotional Gift that Rocks! Talk About a Promotional Gift that Rocks: An Electric Guitar with your logo on it! Your company will be the talk of the trade show! Custom Logo guitars are the coolest promotional gifts ever! Slap your logo on a real, honest-to-God electric guitar and rock the trade show like never before. Other promo products are tired and boring... stress balls, coffee mugs... *yaaawwwwn*. If you're sponsoring a local trade show, blues festival, concert, or chamber event, do it right and make an impact. No one will EVER forget you if your business promotional items include an electric guitar with your custom logo on it! While your promo products are custom electric guitars, the other guys with their pens, frisbees and other useless junk will look like nobodies. Meanwhile, you'll have a rock-star crowd at your booth! Take trade show promotional items to a whole new level with a Fireplant Guitars Custom logo Guitar. 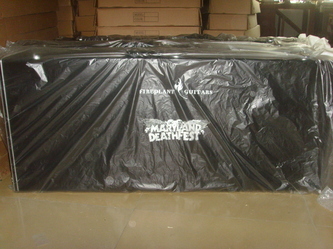 Custom Logo Guitars are Great for Fundraisers and Music Festivals. Your company raises hundreds or thousands of dollars for charity. Your company's brand is never forgotten thanks to such a cool corporate gift. Your company receives honest, positive PR and recognition for their donation to charity. Custom Logo Guitar Raises Thousands of Dollars for Charity at the Safeway Waterfront Blues Festival in Portland, Oregon. Mission Foods (Mission Tortillas) raffled off 7 custom logo guitars (LPCOs) in a flame maple top with a sunburst finish to help raise money for the Oregon Food Bank at the Safeway Waterfront Blues Festival in Portland, OR. The custom logo guitars were a big hit with music festival goers, and especially for the Food Bank. Les Paul replica with a flame maple top and a sunburst finish made for Mission Foods. They raffled off a series of these guitars at the Safeway Waterfront Blues Festival and successfully raised thousands of dollars for the Oregon Food Bank. Fireplant FP-1. Available in natural clearcoat, see-thru black, see-thru green, see-thru red, solid black, solid white. Fireplant Guitars FP-1 custom with your corporate logo on the headstock and on the hardshell case. LPCO: available in sunburst (shown), black and white. Email for custom colors. LPCO w/ custom logo on the headstock and on the hardshell case. BBCO: available in black (shown), white, natural clearcoat and tobacco sunburst. BBCO w/ custom logo on the headstock and on the hardshell case. STCO: available in black, white, blue, red, natural clearcoat and tobacco sunburst. STCO w/ custom logo on the headstock and on the hardshell case. TECO: available in tobacco sunburst (shown), natural clearcoat, black, white, red, & blue. TECO w/ custom logo on the headstock and on the hardshell case. GVCO: available in black, cherry, white and natural clearcoat. 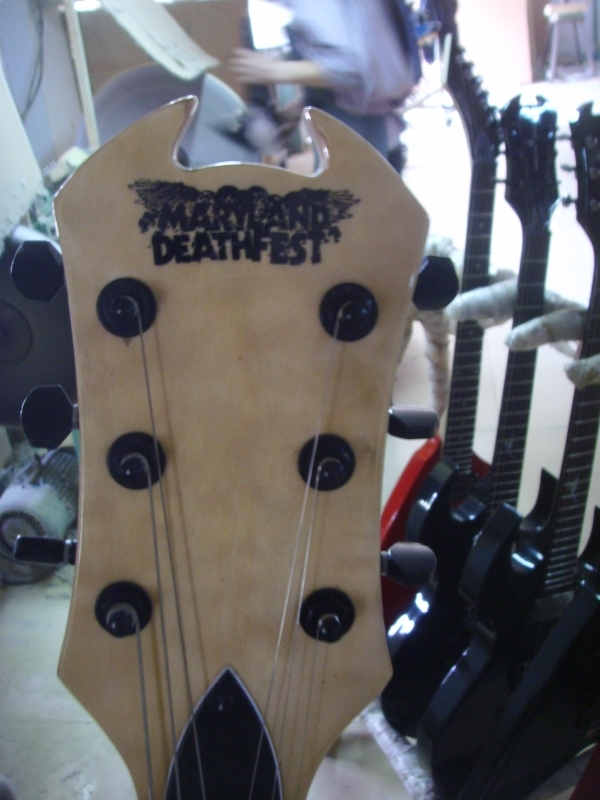 GVCO w/ custom logo on the headstock and on the hardshell case. PRCO: available in see-thru blue (shown), see-thru red, natural clearcoat. PRCO w/ custom logo on the headstock and on the hardshell case. 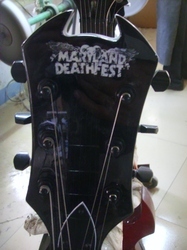 Custom Fireplant Guitars that we had built for Maryland Deathfest. They raffled them off at the 3-day festival and some lucky, lucky fans got to take home a Fireplant Guitar for a few bucks' worth of raffle tickets! Talk about an an "everybody wins"! (Left 2 pics): Custom 7-string bass with a custom, 2-tone finish. Mahogany body with a quilted maple top. This was ordered by Chef James Williams who is also a professional bass player. While playing gigs, he's also advertising his Personal Cheffing business as "The Funky Chef." RICO: available in black, red, white, blue and natural clearcoat. RICO w/ custom logo on the headstock and on the hardshell case. ACCO: available in natural clearcoat and solid black. ACCO w/ custom logo on the headstock and on the hardshell case.